In future when I post an announcement here on the website – match ticket application, travel and news of events – I will alert members on Twitter. To receive Twitter alerts just go to the Tweets section below. You can keep up to date with ESCLA on Twitter @ESCLAnews (for official ESCLA stuff) and @ESCLA1976 and on Facebook ESCLA LONDON ( supporters of ESCLA but are independent). Terrible news. Was a top bloke. My thoughts are with his family and close friends. RIP bill. 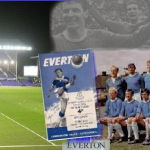 If you ever wanted to know what Everton and being an Evertonian are. Along with Dave, Keith and Tim, Bill took me under his wing when I first started going as a 15 year old to which I will be forever grateful for. RIP Bill. I was really sad to learn of Bill’s passing on The People’s Forum just now. I was a member of ESCLA for many years around 2000 when I was living down in London (local to Bill in Kinsgston) and obviously got to know him well, as we all did. I had bumped into him a few times at matches over the years since and he always remembered me and asked how I was doing. A genuinely lovely man who always tried to get as many Blues as possible to watch our team, however he could – a real gentleman, and as good a Blue as there ever was. I’ve just rejoined ESCLA and heard about the sad news of Bill’s passing. I would love to send my condolences to his family and friends, to which I hope I’m lucky enough to be counted amongst them. I remember once I was late for the Euston train to Lime Street. Somehow Bill was able to persuade the guard to leave a few minutes beyond its allotted time. Heaven knows how he did it, but it enabled me to catch the train and watch the match. I’ve never forgotten his act of kindness in not leaving any of his flock behind. Bill. Watch over us as we go to a match and get home safely. You will be missed. This is Vinny from Bognor Regis, it was a privilege to have known Bill on my travels to Goodison Park, he was one of the lovely people that I met whilst on the train to Liverpool, missing your company on the train Bill. He even used to even have a laugh and joke with my wife when she phoned ESCLA for tickets whilst I was working. RIP to a special person. Is there any way how new topics can be created to stop re writing over old ones as every so often we see the tributes to those sadly no longer with us in comments but there’s no other main text to go with it? Or could there be a section on the website dedicated to Eric, Bill, Pat and others from ESCLA who have contributed over the years. Hello John – there is a supporters blog tab at the top of the main page – there any member can open a topic and have other members comment if they wish – when the website was launched in it’s current form 3 or 4 years or whatever ago, I tried to encourage use of this area to have some membership input but no-one ever posts – at the start someone would now and then but no-one usually responded or commented. As for sections dedicated to our sadly missed friends, and perhaps the odd person still here, if anyone in the membership wants to write such a thing I’m sure everyone would appreciate it.